My two year old was able to relate a little bit better to this book than to others I've read so far, about a new baby joining the family. 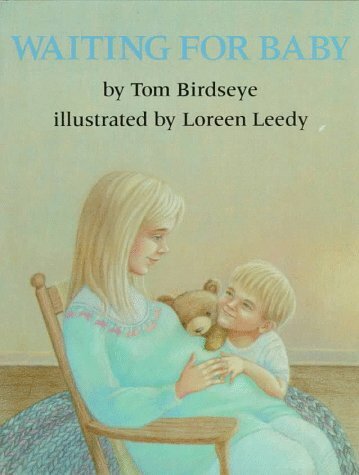 In the book the little boy is talking to the baby in his mommy's tummy, and telling her all the things they will do together. I was able to say "you'll be able to help dress baby too" or "read books to baby too" or "play in the bath too". I want my little girl to feel involved and to look forward to her little brother, so I think this was a good approach. Tom Birdseye - I grew up in North Carolina and Kentucky, an ardent fan of anything that smacked of sports, crawdads, mud balls, forts built in the woods, secret codes, bicycles without fenders, butter pecan ice cream, and snow. I was, however, decidedly uninterested in writing-or any academic aspect of school, for that matter-never imagining that at the age of thirty-five I would become a published author. And yet after two unrelated college degrees, a year living in Japan, and ten years of teaching experience, that is what happened. Life, it seems, is full of who'd-a-thought-its.I live in Corvallis, Oregon, with my wife, Debbie. Our two daughters, Kelsey and Amy, are both off on their own, living and working in Portland. When not writing, working at the Vermont College of Fine Arts MFA program in creative writing, or in classrooms talking with children and teachers about the writing process, I enjoy rock climbing, alpine ascents, scaling big trees, ski mountaineering, snowshoeing, backpacking, mountain biking, running, playing the string bass, and reading.Even after many books published and awards won, at times it still amazes me that writing is my profession. It was such a difficult process for me when I was a kid; I can really identify with the reluctant writer in school today. Everything seemed to get in the way of my completing stories: from being left-handed, to my poor spelling skills, from punctuation woes, to especially a lack of ideas. Fortunately, the right people came along at the right time and helped me see past the hurdles, emphasizing instead the joy of the work and the satisfaction to be had in trying to uncover the important truths that can come out of fiction. Now I carry a small notebook at all times and am always on the lookout for material I can use in a story: ordinary people that would make good characters, the funny, telling, or poignant glimpses of life that are triggered by what I see and hear, and the wonderfully wise things people will say at the most unexpected times.True, I still labor through my stories, wrestling with the spelling beast and the punctuation monster, writing and rewriting, then rewriting some more, until I glean my best, but the process has become one of pleasure instead of pain. I love doing it, and I love sharing it with others. The boy who couldn't imagine himself a writer, now can't imagine himself anything else.